The Planets in Solar Return Report is a computerized report that focuses on the year ahead, from one birthday to the next. Based on the time when the Sun returns to its exact position on your birthday, this report offers insights into the themes and potential circumstances of the year ahead. This report takes a psychological and behavioral approach to the examination of the year ahead. It is extremely well-written and focuses on potentials for growth. Time of birth, example 7:22 PM. Where you were/plan to be on your recent or upcoming birthday. City and state/country. The Solar Return is a chart calculated for the time that the Sun arrives at the exact position of the Sun in your natal chart. That happens once every year around your birthday. This chart is calculated for the time of the Sun’s return and marks the principal events for the year from birthday to birthday. This report examines the overall themes of the Solar Return chart, including the predominant elements and modes, as well as the emphasized quadrants of the chart. If Mercury, Venus, or Mars are retrograde in your chart, they are interpreted. The report then interprets the planets — the Sun through Pluto — and their aspects and positions by house in the Solar Return chart. This report is written by Mary Fortier Shea. The information in this report is based on the author’s experience interpreting hundreds of Solar Return charts for clients over a 20 year period. Included in your report is an interpretation for retrograde Mercury, Venus and Mars, hemispheric and quadrant emphasis, preponderances and lacks, and each planet in every Solar Return house. Through the report, Mary Fortier Shea concentrates on a complete description of possibilities. Her examples range from spiritual transitions, starting a new business, love affairs, marriage, issues involving children and parents, health, education, writing and publishing books, relocation, income changes, career transitions, and much more. She covers both positive and negative possibilities for the different Solar Return placements and configurations she discusses. Name (First name only is absolutely acceptable). Birth Time (example, 7:25 AM; Do not adjust this time – provide the birth time as given at the place of birth). Note: Solar Return reports are very sensitive to birth time–therefore, an accurate birth time is vital for this report to be meaningful. Birth Place (City, state/province, country). Your location at the time of your birthday for the given year (example, if you were in Washington, DC, at the time of your most recent birthday, please enter Washington DC). Important Note: Your Solar Return Forecast begins on your birthday. If your birthday is November 1st, for example, and you order the report in December 2018, you will receive a forecast for the year that begins November 1, 2018, unless otherwise specified. If you want the report for a different year, please specify this in the “Optional Instructions” note during the ordering process, or simply add it to the “Location on the day of your recent birthday” field [example, “report for 2018-2019”]. Important Note: In order for this report to be worthwhile, a birth time is vital. If you don’t know the time you were born, we don’t recommend this report. Pay with your credit card or debit card: We accept payments through PayPal. This safe and secure service allows our readers to pay instantly online using their credit cards, debit cards, or e-checks. The process is easy and safe, and you are not required to register with Paypal in order to complete this transaction. 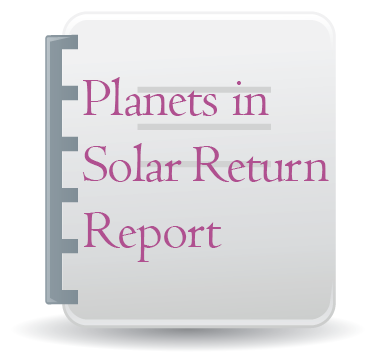 #SRP $4.95 US Planets in Solar Return Report computerized report sent through email within 24 hours of receipt of payment AND full information required to generate the report. Fill in the fields below and then click on “Add to Cart”. ***If you’d like to clarify the Solar Return start date (example: start September 2018) or enter an email address other than the default one used to place your order, please add this to the Location on Recent Birthday field above. 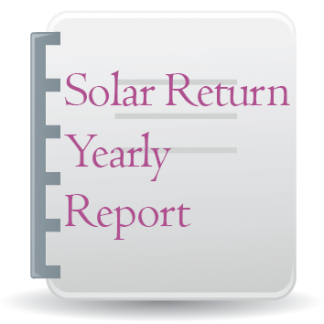 See all four Solar Return report samples on one page here: Sample Solar Return Reports. Read the Report Order FAQ if you have any questions about orders. What is a Solar Return Chart? A solar return chart is a chart erected for the time that the transiting Sun returns to the position of the natal Sun. Approximately once every year the transiting Sun goes through the entire zodiac, every degree, minute, and second of each sign. When you are born, the Sun in your natal chart has a specific position in the zodiac. This position can be measured exactly. At some point in time during each subsequent year, the transiting Sun returns to this natal position, conjuncting your natal Sun. The date and time when the conjunction occurs down to the exact second of arc is the time of the solar return chart. A chart is then calculated for that date, using the time (of the transiting Sun’s return to your natal Sun’s position), and your location (longitude and latitude) at the time of the conjunction. There are many different types of solar return charts: tropical, sidereal, precessed, and nonprecessed. This report is based on research using tropical, Placidus or Koch, nonprecessed solar return charts. Interpretations are very similar to natal interpretations and this should make the material more understandable to both the professional and amateur astrologer. The solar return chart is generally calculated for your location at the time of the Sun’s return. This may occur on your birthday, or the day before or after. During leap years, it sometimes occurs two days before your birthday. If you are going to be away or traveling near your birthday, calculate the time of the Sun’s return before you leave so you can note your position the exact moment of the solar return. You can also calculate the chart for your natal birth location even if you no longer live there. The natal location solar return chart is not as definitive as the relocation solar return, but it can give you good information. The natal location solar return is like a progressed or solar arc chart; you are born with it. Therefore, a natal solar return cannot and will not reflect any free will choices you might have made regarding where you live or where you are when the sun returns. It is a good chart, but it does not mirror the whole picture, especially if you have moved a great distance. Some individuals prefer the chart calculated for their place of residence regardless of where they are located at the time of the Sun’s return. This chart can be useful also, but again, it tends to be secondary to the chart of your actual location at the time of the Sun’s return to its natal zodiacal position. Some individuals relocate for a short period of time, usually about 24 hours, to adjust the house placements of the planets in the solar return. Those who calculate the chart for where they are at the time of the transiting Sun’s conjunction to the natal position sometimes travel to other locations to change the yearly interpretation. The relocation adjusts the angles and cusps, orienting the planets into different houses. The zodiacal degrees and aspects of the planets remain the same, but because of the different planetary placements different areas of life are emphasized. The free will choice to make this adjustment seems to bring this chart closest to the truth. The significance of the solar return runs birthday to birthday with a three month overlap at the beginning and end of each year. The symbolism of the new solar return can be felt as much as three months before the birthday by very intuitive people. Usually, at this time, one becomes aware of new directions, opportunities, and problems. Many times there is even an event exactly three months before the birthday which triggers awareness and signals the beginning of the new solar return. This event is usually very much related to the new solar return and very much out of context with the old one. If you have plans to travel overseas during the three months before your birthday, do not look for the event in the old solar return even if you have been planning to take the trip all year. The old solar return will probably indicate the planning stage, but the new solar return will indicate the trip. The trip itself illustrates change, and since it occurs in the three months before your birthday, it will most likely be indicative of the new solar return chart. On the other hand, the significance of the old solar return may not feel passé until three months after your birthday. The old themes and issues which you have worked with for the year should begin to lose their importance just as the new solar return starts to manifest itself. As your attention naturally shifts to new themes and issues, previous concerns are phased out. This is especially true if you experience a sense of completion relevant to the old tasks. However, there are times when the old solar return drags on. If you are working on a major project for the year, it may be impossible to complete it within the one year time span. If you normally procrastinate and avoid making decisions, tasks associated with the old solar return can easily last past your birthday and into the first three months of the new solar return year. Unresolved issues carried over from year to year become stumbling blocks to further advancement and development. Individuals who consistently avoid facing the real issues in their lives accumulate major problems which are very difficult to handle. The important thing to remember about solar returns, and life experiences in general, is that they are part of a cumulative process. The more attentive and productive you are this year, the greater your options next year. The less you accomplish now, the more limited you will feel as time goes by. Unlike transits which can seem disconnected and singular, solar returns are closely aligned and can easily be viewed as building blocks, one upon the other, year after year. For this reason, each year becomes important and each task has a history and a future. The rhythmic pattern of the solar return helps us to see this. The main transitional month for the change from the old solar return to the new solar return is the month directly preceding the birthday. Issues related to the old solar return are resolved at this time unless they drag on (as explained above), or they are part of the new solar return as well. Issues related to the new solar return become more pressing during this transitional month and are certainly full blown by the birthdate. Sometimes the new solar return simply gains strength during the three months before your birthday and sometimes it comes in with a bang on or near your birthday. Rarely does it happen that a solar return chart starts to change manifestation later in the year. Themes in the chart usually persist for the entire year, but once in a great while one new theme will appear later than expected. In every case, the new theme can be seen in the solar return chart, yet it lay there inactive for some unknown reason. An external event is the triggering mechanism used to activate this inert awareness, and the event generally occurs within the three months following the birthday. It can be hypothesized that unconscious factors help to avoid full involvement with this new issue until such time as it is associated with an external event of importance and thereafter becomes very obvious. Planets conjunct a house cusp within a few degrees may be read in both houses. It is especially important to read outer planets in both houses since they eventually transit or retrograde into the other house, indicating dual or shifting concerns during the year. The more planets that are in a solar return house, the more emphasized that area of life will be during the coming year, especially if the Sun is one of the planets present. Four or more planets in any one house indicate a strong need to be involved with those themes and issues. But the individual may become so focused on this one area of life that perception is distorted and these themes are overemphasized. He or she may not want to think about anything else or accomplish tasks in other areas. The overloaded house becomes a symbol for obsessive preoccupation or emotional overload. Conj. : 8 Deg. 00 Min. 7 Deg. 00 Min. Square : 6 Deg. 00 Min. 6 Deg. 00 Min. Trine : 6 Deg. 00 Min. 6 Deg. 00 Min. Sextile: 5 Deg. 00 Min. 4 Deg. 00 Min. This can show a year with a tremendous amount of activity (which usually amounts to too much activity). You may expend your energy in several different directions by working on a number of projects. Each of these projects will be well-defined and equated with a personal need; however, you will feel torn between all the things you want or need to do. You are trying to do too much. If you overload yourself with too many activities, you will begin to procrastinate, miss deadlines and be forced into crisis management. Your nervous system will be taxed and you will begin to make impulsive decisions with little forethought. You need to be better organized. Perhaps you should finish one project before starting another, or you should seek assistance. If you must juggle a busy schedule, learn to streamline your routine and optimize your use of time and energy. Generally speaking, the ascending sign in the solar return chart is read the same way as the ascending sign in the natal chart. The personality characteristics innate to the zodiacal placement will come through in the solar return. Those activities ruled by the natural house of the ascending sign may also be prominent. Personality changes might be subtle, but can give you a sense of direction for the coming year. Think of it as a style change. Fashions may change from one season to the next. Though you are the same person, your appearance and mannerism shift. The same is true of the solar return Ascendant. This is your chance to work with the best that each Ascending sign has to offer. When the solar return Ascendant is in Aquarius, you need to be free to follow your conscience and to speak your mind. You travel to the beat of a different drum. Rules might not apply. Those in power are not held in high regard. You seek out like-minded individuals and others who think like you do even when your ideas are radical. You buck authority and can be a rebel either with or without a just cause. You function better as an advocate. Dependability is not your long suit. You vacillate between choices and might be downright erratic. The Sun is the most significant planet in the solar return chart. Its position by house shows the most emphasized area of life during the coming year, how and where you expend the greatest amount of energy. The house placement of the Sun is reflected in the interpretation of the other planets, and may be the motivating force behind their symbolism. This is often a year of tremendous change. It is common for individuals with an 8th house Sun to change their life-style completely during this year. There is a death of sorts associated with this house, but it is the kind of death that comes from strong transformation and change. Common examples are quitting work and returning to school full-time, leaving home and getting an apartment, transferring to another part of the country and living in a totally different climate and neighborhood (e.g., moving from the city to a rural area). The emphasis is on radical change. Usually there is at least one major change during the year accompanied by many minor changes. Mental stress can result from the number of changes handled within a short period of time. An increased perception on both the psychological and intuitive levels is common. During the year, you become more aware of subtle energies. Usually, individuals with this placement begin to feel that they see and know too much. They become overly perceptive of others’ true feelings, motives, and psychological inadequacies. For those who can use this new ability positively, this is a time of tremendous growth and enlightenment. Concurrent with this insight into human behavior is generally an interest in psychological and esoteric topics. Knowledge of this nature will help you to both understand and cope with your perceptions. Your own actions can become immune to manipulative ploys. For those who do not understand or cannot appreciate their newfound abilities, this is a time of disappointment and helplessness. Unconscious reactions will take the place of rational interchanges as you respond from the gut level without thinking clearly. It is easy for others to push your psychological buttons and manipulate your behavior since stressful situations or relationships have a greater effect on you. This is more likely to occur if the air element is also lacking in the solar return chart. Examples of compulsive behavior or obsessive/phobic thought patterns will occur regularly. The less aware you are of your own drives, the more easily you will be controlled by them. The awareness of psychological complexes in others should make you more aware of your own psychological idiosyncrasies. Merely reacting to external forces is not as desirable as planning and directing your own life. The whole purpose of this year is to gain power over yourself and your life. You may do this by understanding and overruling your unhealthy psychological impulses. If you don’t, others can gain power by using your own unconscious against you. Guilt and jealousy are just two of the more common manipulative emotional tools others can and will use. You also gain power by recognizing when others are not thinking clearly. It is not necessary to respond to irrational demands. The first step to controlling psychological complexes is recognizing how they influence behavior. The second step is to become aware of why these counterproductive feelings and situations exist. The third step is to simplify your life by eliminating those psychologically unhealthy influences which block rational thinking and meaningful relating. Obviously this is a good time for therapy, for you and/or for those you are involved with. People who seek therapy while the solar return Sun is in the 8th house generally only need counseling for a specific problem rather than deep psychoanalysis. Although some individuals have found this placement very difficult mentally, the greater number of mental illness cases are associated with the Sun in the 3rd and 12th houses, not the 8th. Power struggles over money and morals are common. Your conflict may involve another person or you may be struggling to control your own behavior. Spending practices usually change and debts either go up or down dramatically; they rarely stay the same. Many individuals rip up their credit cards and pay off their bills, but others take out a large loan. Generally, there is nothing in between these two manifestations. If you normally have high credit bills, you will feel the crunch this year and begin to cut back. If you are normally very cautious, you may be asked to take a financial risk because of the changes you are making. The Sun conjunct Mercury indicates that the intellectual mind is actively involved in the implementation of goals represented by the Sun’s solar return house placement. Reading, writing, studying, and communication in all forms will be important along with the decision-making process. The solar return Moon seems to have two consistent themes throughout all of the houses. First and most simply, the Moon is associated with change and fluctuation according to its house position. Secondly, and probably more importantly, the Moon reflects the individual’s emotional nature during the solar return year. While we speak of the Moon as simply an indication of one’s emotional nature, the actual interpretation of the Moon is more complex than simple. The Moon is not just an indicator of feelings; one’s emotional nature is a multidimensional conglomeration of feelings, temperament, needs, and unconscious responses. We cannot look at the Moon as one-sided; we must study its interpretation from a number of perspectives. The Moon represents the individual’s feelings regardless of whether or not they are expressed openly. The type of feelings you have during the year can be demonstrated by the Moon’s sign, position, and aspects. The Moon’s sign can be important even though the Moon has essentially only nineteen placements, because it is indicative of what the individual feels during the year and how he or she is most likely to exhibit those feelings. The major difference between an individual’s feelings and basic temperament is that feelings tend to make up one’s basic temperament. The word temperament implies one’s overall pattern of emotional response; it is an emotional factor that remains constant regardless of the circumstances. On the other hand, feelings imply a specific emotion in response to a particular event or situation. For example, moody people have emotional swings. Their feelings change depending whether or not they are experiencing happy or sad events; however, their proclivity toward emotional highs and lows remains constant regardless of their particular mood at any point in time. Despite feelings of joy or depression, they still have a moody disposition. The solar return Moon’s sign is generally very descriptive of your emotional temperament. It can suggest an array of emotional characteristics including moodiness, sensitivity, coldness, or enthusiasm. Emotional needs play a crucial role in the Moon’s cycle of change and emotional maturation. As explained above, the Moon moves in an understandable pattern through the solar return. During each year, the individual knows certain emotional needs must be met in order to feel secure and fulfilled. These needs, which fluctuate from year to year, cause the individual to create the variety of situations necessary for emotional maturity. The Moon also signifies the unconscious experience. While Mercury’s placement will suggest what the person is consciously thinking, the Moon’s placement will suggest what the individual is experiencing on an unconscious level. Together, the Moon and Mercury (and sometimes also the Sun) symbolize the balance between conscious and the unconscious processes. We like to think that our decisions are based on the integration of rational and emotional information, but during any given solar return year, one process more than the other can influence our decisions, perceptions, and motivations. The focus of attention shifts to accommodate fluctuations in individual patterns of growth. There will be years when you lean more heavily on your emotional responses, tending to trust your instincts and follow your intuition. But there will be other years when you depend more on a logical assessment of your situation. The emphasis on the unconscious usually indicates a year in which the native will be interested in fostering emotional connections and unconscious insights. Logic and factual information may not be meaningful within the context of present situations, which will tend to be emotional. Example situations include (but are not limited to): involvement in counseling, therapy or self-help discussion groups; intense family situations (related to birth, child-rearing, sickness or death); and very nurturing social situations (e.g., communal living, helping the disabled, underprivileged or homeless). Emotional interactions and perceptions will naturally be more important if they are more likely to provide vital information needed to handle experiences during the coming year. An emphasis on the unconscious nature is conducive to emotional growth. All forms of mental activity are associated with an emphasis on the conscious mind, including educational and informational activities. Teaching, learning, lecturing, and writing are several examples. An emphasis on the conscious mind is conducive to intellectual growth. The 8th house is the house of acute awareness of emotional forces and psychological powers. Nearly all of this awareness will result from a newfound ability to spontaneously perceive information on these subtle levels rather than from a rational analysis of any situation. It is the intense awareness of unconscious emotional and psychological issues that forces conscious insight into human behavior. These realizations can be upsetting and you may end up seeing or knowing more than you care to see or know. Acute awareness is also associated with the Sun in the solar return 8th house, but with the Moon here you are more apt to be emotionally involved with the people and issues concerned. It is likely that someone in your immediate family or circle of friends needs counseling. During the year, you grow more aware of your own emotional needs and psychological forces and you also learn to recognize these influences in others. It is very likely that you will study some psychology during the year, but you may become aware of psychological influences naturally without any education. Initial insights can come from associating with mentally disturbed people. The intensity of their psychological abnormality is fascinating, yet frightening. It is common to have an 8th house solar return Moon if you are a professional therapist or astrologer just starting to counsel others. Disturbed individuals need not play an important role in your life and may be mere acquaintances. They are not the real focus of your realizations, they are merely the catalyst. You need to become more aware of the psychological influences affecting you and your immediate relationships. Intense realizations associated with bizarre personalities will give way to insights into subtle manipulations and power plays. Eventually, psychological realizations can occur during the simplest interactions with others. If you are caught in an emotional power struggle, it will become more obvious how you and/or others manipulate rather than state clearly what you need. Psychological complexes and hurt feelings complicate relationships and make it more difficult to discuss problems rationally. Unconscious feelings may undermine conscious decisions. Ambivalence is common. Obsessive-compulsive behavior, jealousy, guilt, unexplained anger, and helplessness are frequently clues that something is wrong. Recognizing and understanding your own psychological idiosyncrasies will give you great power over your own life. Insights into your defensive reactions will help you overcome barriers to intimacy. Increased intimacy is especially important since superficial relationships and superficial discussions will not suit you this year. You need to be able to talk at length and in depth about what you are feeling and perceiving. It is during these discussions that initial realizations are triggered and later confirmed. It is also during these discussions that you formulate and express new behavioral patterns that sidestep psychological inadequacies. Emotional situations tend to be more complicated and intense. Issues are no longer black or white, good or bad. Decisions are less straightforward, especially if you feel responsible for the well-being of others. For example, if you have children and were offered a transfer to another state, you would not make this decision without careful consideration. On one hand, the move may improve your career possibilities, but on the other hand, the move could have a great impact on your children. You must consider the emotional or psychological ramifications of your decisions since they are more likely to affect others. If partners or family members are moody or unstable, you may have to think before you speak if you want to avoid upsetting responses. You may be in a delicate position requiring great diplomacy and tact. Others can interpret what you say incorrectly or overreact. You will be dealing with intense feelings and may expect others to involve you in very emotional circumstances. If you counsel others professionally, it will be easier for you to control these situations. If these situations are appearing in your personal life, you can deal with them effectively on your own or seek advice. Increased intuitive accuracy will encourage your reliance on this mode of perception. Psychic and intuitive realizations grow stronger, but may seem less controllable. Even if you do not consider yourself psychic, this is a good time to trust your hunches, but if you are psychologically stressed, you may be less able to distinguish true psychic impulses from fears and anxieties. If this is the case, you should reserve judgment until your powers of discrimination grow stronger. The Moon in the 8th house can show changing shared resources or economic dependency. If you share funds with your spouse or some other person, the amount of money you receive will change either positively or negatively. On the other hand, your own personal resources are more likely to decrease in comparison. The reduction need not be much, but you are more likely to feel like a dependent rather than an economic equal. There could be very valid reasons for this. For example, you may be on pregnancy leave or attending school. Financial power struggles are possible. You and your partner or someone else may fight over how to handle money or pay bills. These arguments might be very emotional and further complicated by unresolved psychological issues. Clarity and a willingness to discuss needs will help you to reach positive compromises. The Moon in the 8th house also indicates a change in indebtedness. Debts either go up or down but they rarely stay the same. Moon sextile or trine Jupiter in the solar return indicates a positive outlook on life. This can be a year of happiness and contentment. You should be optimistic about the future and your potential for success. Use your talents and abilities to advance professionally or evolve spiritually. Expansion into new areas is advantageous. The house placement of Jupiter should indicate where expansion is likely to occur. Your ability to express your feelings within a significant relationship is important to your own emotional growth, and also to the growth of the relationship. Jupiter symbolizes your ability to expand and the Moon symbolizes your feeling nature. Together in aspect, they emphasize the process of sharing emotions, having those emotions understood, and growing from the interchange. Expansion through emotional interchange and relatedness is the key. For example, if you are involved in counseling, this exchange is crucial to the therapeutic process. If you are involved in a serious relationship, sharing your feelings is necessary for the development of greater intimacy. It is important to convey serious emotions as well as cheerful feelings, especially if you are in a situation where candidly expressing your feelings could motivate others. For instance, if you are working on a humanitarian project and you need volunteers, your ability to inspire others with your honest portrayal of the situation will help your cause. Having the Sun and the Moon in the same house is like having all of your eggs in one basket. The Sun is associated with conscious experience and symbolizes a need for external achievement and recognition. The Moon, on the other hand, is more closely associated with unconscious experience and the need for internal emotional fulfillment. Whenever they appear in the same house, there is a conscious and unconscious emphasis on the same area of life. Matters related to the house placement are very prominent during the solar return year. The convergence of the two lights in the same house symbolizes the merger of two separate and distinct patterns of growth and the formation of a new, more complex pattern based on the meeting of the Sun and the Moon. It seems reasonable to speculate about the existence of this complex cycle since whenever the Sun and Moon appear in the same solar return house; there is a sense of “newness” attributed to the events of the year. Significant (Sun) changes (Moon) can occur, and these changes may be so far-reaching as to signal the beginning of a new era. It is during this year that the individual is involved in a new experience and/or new issue. Generally, the closer the Sun and the Moon are within the house, the greater this sense of newness and the greater the sense of agreement between the conscious and unconscious levels. The farther apart the Sun and Moon are placed, the more likely one is to experience two separate desires or needs. When the lights are not conjunct and not even in the same zodiacal sign, you are of two minds concerning the subject matter of the house placement. This suggests that your conscious thoughts on the matter at hand will be different from your unconscious feelings. In this case, you are apt to feel pulled in two directions. For example, a new divorcee with this configuration was on her own after many years in a restrictive and unsatisfying marriage. She loved her newfound freedom (Sagittarius Sun in the return 1st house), but she also loved the intimate and sexually fulfilling relationship she now had with her new boyfriend (Scorpio Moon also in the 1st house). During the solar return year, the question of marriage came up many times. The woman did not want to choose between two equally desirable situations. She wanted to fulfill both her need for freedom and her need for intimacy. Mercury has two basic interpretations in the solar return chart: it symbolizes what you are thinking about and your mental condition during the coming year. What you are actually thinking about is shown by the solar return house placement of Mercury. The important thing to remember about Mercury’s placement is that it is indicative of a mental exercise only. Alone in a house, Mercury can show mental preoccupation without psychological pain or physical consequences. It suggests the ability to make decisions only, and may not be a clear indication of action in any particular area. Mercury’s aspects to the other planets indicate how information is gathered, assimilated and integrated into attitudes that persist for most of the year. How easily this is accomplished, and in what manner, is suggested by the aspects themselves. Conditioning is noted by solar return aspects to Mercury. Squares and oppositions to Mercury indicate possible sources of tension and conflict. If Mercury is in an air sign, (Gemini, Libra, or Aquarius), rational thought processes are emphasized. If Mercury is in a water sign, (Cancer, Scorpio, or Pisces), strong emotional factors influence thinking. If Mercury is in an earth sign, (Taurus, Virgo, or Capricorn), the tendency is to be practical. If Mercury is in a fire sign, (Aries, Leo, or Sagittarius), the individual is motivated by self-interest, passion, philosophy, or spirituality. When assessing the conditioning of Mercury, it is also important to note the sign and conditioning for the Moon and whether the Moon is in an air or water sign. This will help you determine if the thinking process or emotions are dominant during the year and if integration is possible. The phrase “acute awareness” encapsulates the interpretation of Mercury in the 8th house of the solar return. Your mind is more insightful and reflective during this year, and there will be times when you will see more or know more than you were previously aware of. Knowledge of the unconscious mind grows quickly, leaving you overwhelmed by the change. You are more aware of nuances, motives, and psychological conflicts in yourself and others. Subtle shifts in power and power plays will be more obvious to you now. The interpretation of Mercury in the 8th house is very similar to the interpretation of the Sun or the Moon in this house, but there is an important difference. When Mercury is in the 8th, you are more apt to gain understanding of psychological issues as a result of training and education. You become intellectually aware of psychological complexes and power struggles, but they generally do not disrupt your life or upset you emotionally. When the Sun is in the 8th house, you are more likely to be disrupted by the turmoil of living with your own psychological issues or those of others. When the Moon is in the 8th house, you may be upset emotionally by complex unconscious forces and power struggles. Mercury in the 8th house is generally not upsetting, only insightful. There are several ways to initiate and stimulate this psychological insight. You may study psychology directly or you may become involved in one of the occult sciences. You may see a counselor during the year even though you might not feel seriously stressed. Mercury in the 8th house implies the ability to grasp psychological information intellectually. Generally, by itself, Mercury is not indicative of nervousness or anxiety. If you are just entering therapy at this time, you may be doing so to gain self-knowledge rather than because of incapacitation. If you have been in therapy for a while now, this may be the year when therapy pays off and suddenly you begin to see the behavioral patterns that have been affecting your life negatively. Psychologically, you may be more withdrawn and cautious during the year, preferring to talk to one person in depth rather than several friends superficially. Small talk will not interest you. Information that is factual and blatant will not be as exciting as what is less obvious, sexual, or mysterious. You see and understand a lot more than you express. You may withhold information deliberately or just be reluctant to talk openly. This is a good time for financial planning and consolidation loans. If your debts have risen recently, you might want to establish a payment plan for reducing those bills. If you share income and expenses with another person, review the division of debts and plan for future expenditures. Reread your will and investigate estate and tax plans. Mercury square or opposite Pluto in the solar return chart indicates that your conscious mind is very aware of unconscious material and psychological complexes. This awareness may originate from naturally occurring insights into human behavior or educational pursuits, but it is more likely to arise from conflict. You are better able to perceive what is unspoken or hidden. Motivations will be clearer to you even when they are not stated. The body language of others can be very revealing. Attempts at manipulation and psychological games will also be more obvious. Most likely this awareness will not be one-sided. You will be as aware of your own unconscious nature as you are of psychological complexes in others. Resurfacing unconscious material can spill over into everyday consciousness and distort perceptions and thinking patterns. If you are involved in repetitious verbal battles over ideology, prejudice, or intolerance, realize that these confrontations may be related to your own psychological tendencies. They might not be the sole product of other minds. Being aware of psychological dysfunction can be stressful, especially if you know more than you are capable of handling. This is an excellent time for counseling, should you feel the need. Others may be adamant about their beliefs and opinions. Their information is not necessarily factual or proven, but they can be loud, insistent, and controlling. You have to tempter your responses and limit reactions. Fanning the flames will only make situations more contentious. The implication here is that knowledge is power, and specifically in this case, it is knowledge about the unconscious mind which conveys power to those who are aware of it and able to gain insights from it. This information is as valuable as intellectual facts gained from school. The more you understand about the unconscious, the more you are able to control your own impulses or resist the manipulative behavior of others. Although initially this increased psychological awareness may be stressful in itself, the understanding and control you achieve in the end can actually lead to stress reduction. When Mercury is square or opposite Uranus in the solar return chart, you might be subjected to psychologically stressful situations. Increased nervousness, anxiety, and irrational thinking may be directly related to these taxing circumstances. Question the necessity for excessive tension in your life. If possible, withdraw from those situations that strain your mental and physical health. Stress is also caused by continuing disruptive changes in the information received. Startling facts and shocking realizations are possible according to the house placement for Mercury and Uranus. The stream of shifting information impedes the decision-making process. Thinking tends to flip-flop with each modification. Opinions expressed may require a future retraction. The task is to think before you speak and only make decision after a thorough investigation. The good news is that this can be a creative time if you approach problems from several different angles and do not get locked into one structured way of thinking. Use this time to be innovative and original. Brainstorm with others and channel insights into practical applications. Because your mind can be unstructured, your ability to think clearly may be interrupted by erratic impulses and an inability to concentrate over any length of time. New information and ideas might be more exciting than reorganizing what you already know. If you must work on a major project that requires sustained mental energy, take frequent breaks. Work on calming and nurturing your nervous system. You may want to practice relaxation techniques and avoid stimulants. Venus is the key to understanding your relationships and financial situation for the solar return year. Many times these two areas go hand in hand; financial security tends to be coupled with secure relationships while financial difficulties are more likely to occur when close relationships are strained. Although this correlation is common, it is not the rule, and interpretations for finances and relationships should always be viewed separately. When assessing Venus in the chart, evaluate Venus twice, first with respect to the other relationship factors in the solar return and then with respect to the other monetary indicators. In this way, you can develop a clear picture of each area of concern. Venus also indicates a need for comfort and it is informative to note what has preceded Venus in its present house position. If, during this year, Venus resides in a house which last year represented an area of conflict, Venus would imply an improvement in the conditions associated with that house and may indicate a healing process. Benefits commonly follow after much hard work. A Venus placement in the solar return chart following a more difficult placement during the previous year can indicate great reward. Your awareness of this possibility may encourage you to work harder in more problematic areas since you can see the rewards in the following year. Venus, by house, shows what relationships will be important during the coming year. For example, Venus in the 3rd house might indicate that relationships with neighbors or community involvement will be emphasized. With Venus in the 6th house, pleasant office conditions, and good co-worker relationships will be important. But the interpretation of relationships as they appear in the solar return chart involves more than an understanding of Venus’ house placement. Look at the 5th and the 7th houses, especially if you are interested in a love relationship. The more planets in these houses, particularly the 7th house, the greater the need to relate on a one-to-one basis. Generally, the 5th house shows sexual affairs, while the 7th house indicates a greater commitment (though not necessarily marriage). Clandestine affairs or secret relationships are more likely to occur when Venus and/or the Moon appear in the 12th house. One fact about marriage and the solar return chart is surprising. The solar return is not necessarily a good indicator of a marriage during the year. The beginning of a relationship might be easily seen, but the marriage itself is more likely to be reflected in other techniques. On the other hand, postponement of a marriage or the refusal to make a commitment can be easily seen with Saturn, Uranus or Neptune in the 7th house. Venus also relates to money and finances, and can be used to evaluate these circumstances for the coming solar return year. The house placement for Venus may indicate how you are most likely to generate income. This is sometimes true, but not always. Venus in the 9th implies a teaching salary, but if you don’t teach, the emphasis will be on your beliefs concerning relationships. Don’t stretch your economic interpretation of Venus’ house placement. If the house position applies, the situation will be obvious. If the house position does not seem to apply to finances in particular, Venus will be more consistent with relationship situations during the year. For finances, it is perhaps more important to look at the planetary placements in the 2nd, 6th, 10th, and 11th houses, especially if you are interested in the amount of money you will be able to earn by employment. The 2nd house is the primary money house, but it also gives indications of spending practices. Any planets in the 2nd can reflect your salary and/or your spending practices (regardless of how much money you earn); it is always possible to spend more than you make or make more than you spend. A 7th house Venus emphasizes the importance of relating positively to others. This usually applies specifically to your relationship with one particular individual (such as a spouse or business partner), but may apply to others in general. Relationships can improve or deteriorate during the year, depending on your abilities and the situations involved. Effective relating is important to the task at hand, and your ability to foster and sustain good relationships affects your ability to succeed and prosper. For example, if you seek to form a business partnership during the year, your ability to get along with your future partner would have a direct beneficial or detrimental effect on the success of the business. It is to your advantage to sharpen your negotiating skills and learn to compromise when the situation calls for it, regardless of the type of relationship you are involved in. Realize that you can allow your own personal needs to be superseded by your partner’s demands, wishes or expectations. If your spouse is being transferred to another state, he or she may ask you to follow despite your own personal situation or preferences. Your wishes can be superseded by the needs of the relationship, but in the final analysis, the move may prove positive for you both. This year, you can benefit directly from your associations with others, perhaps more so than if you tried to go it alone. A new writer worked closely with a literary agent to gain the writing contract of her choice while Venus was in the 7th house. She listened and responded to her agent’s suggestions about the first draft of the manuscript. Because the two developed a good working relationship based on respect for each other’s opinions, the manuscript was improved and the writer ultimately benefited greatly. This is an excellent time to ask for favors and assistance from others. You tend to reap what you have sown. Negatively, Venus in the 7th house can indicate that you allow a relationship to suppress your individual identity, restrict your personal freedom and tax you unnecessarily. You placate your partner and bend over backwards to please him or her, rather than relate as an equal. You may feel torn between satisfying your own needs and those of the person you are involved with, especially if there are oppositions between Venus and planets in the 1st house. In an extreme case, the relationship becomes more important than self-preservation and you allow your needs and energy to be drained away. When this occurs, subservience replaces relating, acquiescence replaces compromise, control replaces respect, and you begin to feel that it is your job to keep someone else happy. A young female administrative assistant at a local charity spent more time fulfilling her employer’s personal needs than concentrating on her own charity work. She was in a precarious position and since he had the power to fire her, she allowed her own needs to go unmet. Focusing on the cooperative interpretation of this placement will help one avoid the pitfalls. When Venus is sextile or trine Uranus in the solar return chart, changes in relationships may occur. For some people, this can mean a sudden attraction and the excitement of a new love. Involvements may be very strong, very quick, and may or may not have staying power. New relationships might eventually lead to marriage, but probably not during this solar return year. Loose associations are common. Friends become lovers and some love relationships seem more like friendships. Occasionally, relationships and attractions are less than conventional. A general mood of change and transition may permeate all partnerships, whether old or new, personal or professional. Difficult relationships may end amicably, but for those in a healthy relationship, changes will occur within the relationship itself and do not indicate a break in ties or a loss of commitment to one another. For some people, the changes involve a new and exciting experience, such as the birth of a child. New skills and patterns of behavior must emerge. Other common examples of change are relocation, retirement, travel, and changes in the number of people living in the home. Financial changes are also likely to occur with Venus sextile or trine to Uranus. You may move in with a lover, spouse, or friend and begin to share expenses. You might receive a financial windfall or pay raise. You can be working on a commission or incentive basis, or be involved in a profit-sharing plan at work. Self-employment is also possible. Starting a new business from scratch is generally a major financial adjustment. For one reason or another, the amount of money available to you is likely to change or fluctuate. This is a good time to be creative, both in the arts and with life. Discover hidden talents and take risks. When Venus is sextile or trine Uranus, you can be insightful and inspired. Make the best of changes and opportunities. Venus sextile or trine Jupiter in the solar return chart has several possible interpretations. You can benefit, either directly or indirectly, through the influence or assistance of others. Benefits are shown by the solar return house placement of Jupiter. Relationships can be very rewarding and you reap what you have sown. If you have been helpful and understanding to others in the past, you can expect the same treatment now. Your lover, business partner, or spouse should be actively supportive of your goals, both financially and emotionally. Indirect benefits can also come to you through partnerships. For example, your spouse accepts a job transfer to Colorado and you always wanted to live in ski country. What you believe to be true about most relationships tends to be consistent with your experience. Developing a philosophy of relationships will help you and your partner make joint decisions regarding morals and ethics. Your beliefs match those of your mate and any religious differences are not important. You give each other the freedom to develop spiritually, intellectually, and creatively. The tendency is to be generous with time, money, and resources. This can cause you to be overscheduled or overextended financially if you do not set limits and establish priorities. Additional funds might become available, but money can flow out as quickly as it flows in, especially when you make large purchases or have major expenses. Pulling together as a team and establishing a sense of balance will optimize you relationship and experience this year. Venus square or opposite Mars in a solar return chart can indicate conflicts occurring in a significant personal relationship or business partnership. The area of contention is shown by the solar return house placement of Mars. The relationship or benefit being compromised is indicated by the house placement of Venus. For example, if Venus is in the first house, indicating the need for gentleness and time alone while Mars is in the 7th house of relationships indicating high energy and aggression, partners will have different needs and expectations during the year. They should respect each other’s preference and seek areas of integration and balance. Actions can provoke negative responses from a partner. Relationships that are faltering to begin with become combative involvements in which the participants undermine independent or joint efforts and fight over money. Tension will increase until the issues are dealt with directly. Sexual attraction and satisfaction are important factors in both new and established relationships and contribute to or detract from their success. Even though the square and opposition are known to be stressful aspects, they may indicate an increase in desire. Conflicts might exist as separate and distinct from attraction, though generally they are impediments. Financial cuts are possible when Venus is square or opposite Mars, but it is more common to hustle for the money received. The harder you work, the more you are likely to earn. Spending also tends to increase. The planet Mars represents an outward thrust of energy in a solar return chart. It is an active energy geared toward producing an external manifestation brought about through interchanges with the environment. The arrow on the symbol for Mars illustrates this outward thrust and movement. The interplay with the environment and the area of greatest energy expenditure are shown by the aspects to Mars and its house placement. There can be a number of ways in which the outward thrust of energy and activity manifests in the external environment. Positive manifestations implied by Mars include self-motivation, independent action, initiation of new projects, assertiveness, fulfilling sexual encounters, and original or pioneering creations. But anger, aggression, and sexual abuses represent negative and wasteful expenditures. Energy lost in negative exchanges cannot be used productively. Mars, by its very nature, denotes the spark of initiation and self-motivation. Original pursuits, independent actions and new projects are fostered during the year and are typically associated with those areas of life denoted by the house placement of Mars. Because of the new endeavors and the enthusiasm generated, these areas then become the focus of energy use as the level of activity increases and you begin to feel driven to work, accomplish, and complete. Sometimes ambition and competitiveness augment the need to excel, but an energetic attitude can flow without these personality traits since self-motivation tends to spring naturally from an inner source. During the year, activities may be specifically tied to your ability or inability to be assertive. In its most positive manifestation, the planet Mars denotes an active force. Except for a few of the more subtle interpretations for Mars, the implication is an external thrust which affects other people, places, things or circumstances. For example, if you install a home office, you make a change in your living situation. If you start your own business, you do, in effect, change the environment. If you insist on control over your own finances, you create a more independent relationship style. In each of these cases, you are the individual initiating the activity and asserting your own needs which are essential to the task at hand. The inability to be assertive can only lead to frustrated desires and anger. Your efforts will be thwarted until you make adjustments in your thinking. When extreme frustration occurs, more energy is expended toward being angry than working toward correcting the problem. The house position of Mars and its aspects to the other solar return planets provide information about the circumstances which will trigger angry responses in you. Anger may arise from a number of different circumstances, including, but not limited to, frustration at the inability to fulfill your own needs, aggression from others, stressful surroundings or unconscious resentment that has not been resolved. Anger is a signal that your attitude and/or environment need to change. Energy lost to anger cannot be used creatively. Anger that stimulates creative action can be recouped. Your task for the year will be to learn to deal effectively with these anger-producing situations. Do not allow anger to be triggered when insight coupled with assertiveness, tact or corrective action would suit your purposes better. As you focus on negative situations and gain understanding, you can begin to funnel your energies into the most positive manifestations. Aggression is a distortion of assertiveness. Assertion is the defense and maintenance of your own rights; aggression is the infringement or attack on the rights of others. Anger is most likely the motivation for the attack, although psychological idiosyncrasies may provide other motivations (of which fear is the main culprit). All acts of aggression, by their very nature, should produce anger in the person attacked, though some individuals, because of their own psychological nature, respond in other ways. Where you find Mars by house position indicates where you are most likely to meet the aggressor during the coming year. Either you will have to deal with a hostile person in the environment or you will be confronted with your own acts of aggression. If you are able to meet your own needs through assertion and you know your own rights while conscientiously defending them, you are less likely to be the aggressor or allow aggressive actions to arise in others. You should be able to strike a balance between your needs, and rights, and the needs and rights of others. In this way, you maintain your position relative to the environment. But regardless of how fair you are in your dealings with others, you may still have to defend your own rights. Mars as an indicator of sexuality is not consistent with the interpretation for every house position. There is the possibility that sexual intrigue can apply to the situations denoted by any of the planet’s placements, but the connection is not always obvious. Themes of initiation, high energy output, anger, and aggression appear more consistently. For example, Mars in the 10th may mean a sexual attraction between you and your boss, but it is more likely for you to be extremely active in career endeavors. Your boss can be a prime motivator toward career success or he could actually be very offensive and thwart your efforts. Note the aspects between Mars and your other personal planets for further information. The sexual implications of Mars seem more obvious in the relational houses, but then individual differences apply. Sexual fulfillment is directly related to the appropriateness of sexual activity given the particular situation and any restraints or inhibitions involved. This year you will identify strongly with your religious, philosophical, and ethical beliefs, and this is a good time to actively pursue further investigations in these areas. Round-table discussions of these topics lead to a clearer understanding of issues and possible implications. Spiritual concerns and dilemmas may be especially important during the coming year. Learn to share your thoughts rather than force issues. Support your words with actions and work for those causes you believe in. Motivate others with the strength of your conviction. Your commitment can be inspirational. Positively, this is a time when you can become a strong proponent of truth and justice; but, negatively, you may be prejudiced or intolerant of the beliefs of others if you use your convictions to assume a holier-than-thou stance. There is no guarantee your beliefs will be beneficial to your spiritual growth or to those you come in contact with. The 9th house is the house of all beliefs, not just those that are philosophical in nature. With Mars in this house, if you believe you have been wronged in the past, you will tend to take an offensive rather than neutral position regarding similar issues, events or relationships. Anger could be inherent to your belief system, making you feel duty-bound to correct past situations or eliminate the possibility of recurrence. If you work in the humanitarian field, you can fight for the rights of underprivileged people rather than brood over a personal problem. Mars in the 9th is noted for soapbox warfare (standing on a soap box and pleading with the masses to end this deplorable situation). But the difficulty with this placement is the very negative manifestation which allows the individual to justify offensiveness in personal matters. Inequities in the past should not become an excuse for inequities in the present. A strong defense is more appropriate to this placement than a strong offense (as long as the defense is not an impenetrable fortress). During the year, review your responses to anger-producing situations and consider ways to express anger in a more constructive manner. You need to learn to cope effectively with certain common or recurring situations in your life. You may not be able to control these difficult situations completely, but you are able to control your reactions. Choose a course of action which provides you with a good response while not escalating the problem. Now is the time to develop a game plan for handling anger-producing events, especially if you presently find it difficult to cope. Your anger might have been ineffectual in the past. Jumping up and down and screaming is generally ineffective. So is total retreat. Learning to express anger intelligently is an important task to be mastered during the year. The 9th house is also the house of travel. With Mars in this house, you tend to take quick and perhaps nerve-wracking trips. Most likely, you may not be able to relax while traveling, and problems with weather, travel connections, and accommodations are possible. That does not mean that you can’t enjoy traveling, but you should be careful not to pack too much into each trip. If you are very careless or angry, it is possible to have a minor accident while traveling, but this will probably occur only in very difficult, careless or angry situations. The mind can be very active, and consequently, this is a good time to be self-taught. You can motivate yourself to gain knowledge while studying on your own. You should be involved in some intellectual pursuit, either alone or with others, be it school, teaching, lecturing, learning, etc. This is not the year to let your mind lie idle. Do research and find your own truth. Actively acquire information and organize it according to your beliefs. Further clarification of Solar Return dates: A Solar Return chart is cast each year for the time that the Sun returns to its exact position at birth. My birthday is September 18th, so my Solar Return charts will always start on or around that date each year. (It may occur on September 17th or 19th some years – each year, the exact time and date will be different). A Solar Return report draws up a Solar Return chart for the birthday, and that chart is representative of the year following that date. It’s important to note that unless you were born on January 1st, Solar Return reports do not cover calendar years. So, if your birthday is April 15th, for example, a Solar Return chart drawn for April 2019 will cover the year from April 2019 to April 2020. If your birthday is November 20th, the Solar Return chart cast on November 20th, 2019 will cover the birthday year spanning from November 2019 to November 2020. If it’s June 2018 and I want to place an order for my upcoming Solar Return year (that is, a report that would cover the year from September 2018 to September 2019), I would specify that I want a report for “2018-2019,” or I would write that I want the report to “start September 2018”. The location of the Solar Return chart would then be the location I expect to be in September 2018. Similarly, if my birthday were April 10th, my Solar Return charts will always occur in April and the periods covered for Solar Return reports will always be the year from one April to the next April. All reports are processed manually. Simply email if you’d like more details or if you have special requests for your order. Which Solar Return (Birthday Forecast) report is best for you? Many of our customers order more than one Solar Return report for the same forecast period, as each report offers a different perspective on the same period. 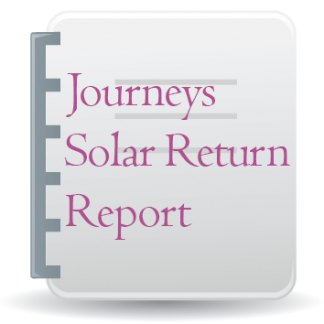 The Journeys Solar Return report is perhaps the most detailed and examines the most factors. However, some may find this report too detailed. As well, it is highly analytical, examining both negative and positive potentials rather bluntly at times, making it best for students of astrology. The Solar Return Yearly Forecast report tends to be more focused on potential events than the other reports. 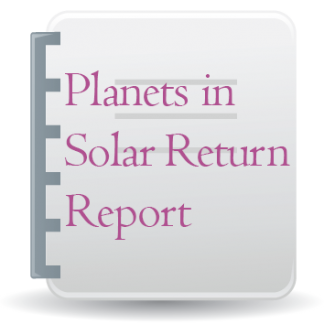 The Planets in Solar Return report takes a psychological and behavioral approach to the forecast period, offering strategies for dealing with the planetary influences of the Solar Return chart. This report is most recommended for growth-oriented individuals and those not familiar with astrology, although it’s also excellent for those who have knowledge of astrology. The Merriman’s Solar Return report adds forecasting for specific dates. Like the Journeys, it has some blunt descriptions of negative potentials. If this makes you nervous, it’s better not to order either of these reports. If you’d like to compare the four reports, I have put all four Solar Return report samples on one page here: Sample Solar Return Reports.